The other day i made a Rangpur Lime Marmalam out of some that Carol had given me from her tree. I also had the pleasure that day of introducing her to the new cafe at Dandelion. She’d not been in the new place and was impressed by watching a chocolate factory operate at full tilt, and then she was blown away by a cup of their Mission hot chocolate. Her face registered shock at the first sip, it was so good. And speaking of Carol, i got from her Gyalden’s recipe for chicken curry and have inserted it in the recipes as, oddly enough, Gyalden’s Chicken Curry. This is the best chicken curry i’ve had in this country, and the recipe is easy. Try it. Oh, and getting the recipe spurred me into doing a search for a good Indian grocery in SF. Bombay Bazaar used to be good, but it went into a gradual decline, moved to a little slot on Duboce with a pitiful selection and half empty shelves, and finally closed its doors. From the Yelp reviews it appears that the best of the current lot is a place called Jai Ho in that shopping center by Safeway on Webster, so i checked it out. I went in mainly to get good curry powder for Gyalden’s recipe, and was a bit disappointed by the indifference of the clerk. I mean, i asked him about fried moong dal, and he clearly understood my Hindi but said they didn’t have the item and directed me to a huge selection of dried beans, including lentils. As i cruised the aisles, though, i found bags of fried moong dal in the snacks section. The good news, though, is that they had a wide selection of curry powders. Not only that, they had Patak’s hot lime relish, my favorite brand of this condiment. The good news from yesterday is that it was the 2013 opening day of the Castro Farmers’ Market, an occasion so gala that i actually shaved for it yesterday morning. My favorite vendors were back, Shelly with her excellent free-range eggs, Spring Hill with the best butter i’ve had in this country, Happy Boy Farms with consistently the best baby arugula in town, and Home Maid with their exquisite Fig and Olive Spread. And there’s a new vendor, Bernard Ranches of Riverside. I was cruising by their booth and noticed those huge hybrid grapefruit bred for sweetness and then beside them some much smaller red grapefruit, also way too sweet for my taste. And then in a separate bin i noticed a slightly smaller one that looked like it could be the old, sour Marsh variety that i love so much. I asked, he complimented my perception, and then put back the identifying sign that had fallen aside. I bought five even though i have a week’s supply of them from Hamada. Well, i had to reward Bernard for bringing them and, of course, needed a couple for comparison. Got home and tried the smallest one even though i’m supposed to eat only one at breakfast, and i’d already had it. Yep, it’s a Marsh, and almost as good as Hamada’s at the Ferry Plaza Farmers’ Market. Now that there are two places in San Francisco where you can buy these, you have no excuse not to. The rest of the food news is that i spent today making a kumquat marmalam from a big bag of kumquats Glenn Tanimoto gave me last Sunday at the Heart of the City Farmers’ Market. The light freeze they had down there spared the other citrus, but kumquats are so sensitive that it stymied their full development and Glenn felt their quality was not up to his standards. Still made good marmalam, though. See the 2013 Production Report for what’s new in preserves. 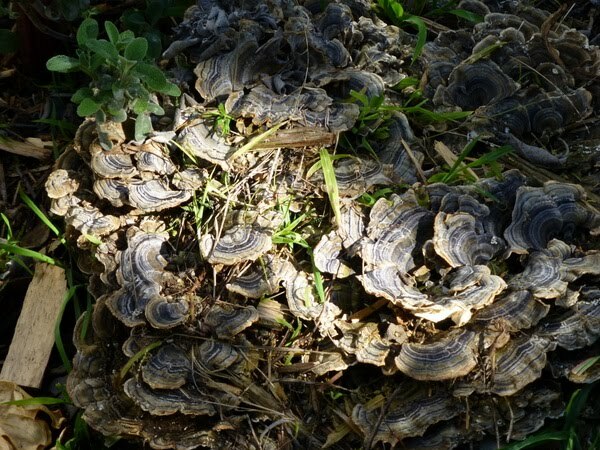 And finally, here’s a Trametes versicolor growing out of a buried stump on Hartford Street. Spotted by my friend Oliver and identified by my friend CK. The reason it’s in this food post is because Wikipedia says it’s “edible but not palatable”. Hmmmm. Maybe sauteed with some fresh green garlic?